Obstructive sleep apnea, or OSA, is a sleep related breathing disorder that causes your body to stop breathing during sleep. OSA occurs when the tissue in the back of the throat collapses and blocks the airway. This keeps air from getting in to the lungs. This is a very common sleep disorder. It happens because the muscles inside the throat relax as you sleep. Gravity then causes the tongue to fall back and block the airway. Blockage of the airway can happen a few times a night or several hundred times per night. Do you ever wake from sleep with a choking sound or gasping for breath? Has your bed partner noticed that you snore loudly or stop breathing while you sleep? If your answer to any of these questions is yes, then you might have obstructive sleep apnea. Many people with OSA are sleepy during the day. They find that they are still tired even after a nap. When you stop breathing, your body wakes up. It happens so quickly, you aren’t even aware of it. This disrupts your sleep process. You can stop breathing hundreds of times in one night. This will make you feel very tired the next day. Oral appliances are dental mouth pieces that fit very much like a sports mouth guards or removable orthodontic retainers. 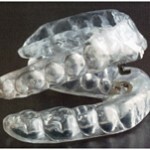 They are used to treat snoring and obstructive sleep apnea. The device prevents the airway from collapsing by either holding the tongue or supporting the jaw in a forward position. Since oral appliances are non-invasive and easy to use, they may be considered as an early treatment option. Oral appliance therapy (OAT) involves the customization, selection, fabrication, fitting, adjustments and long-term follow-up care of specially designed oral devices, worn during sleep, which reposition the lower jaw and tongue base forward to maintain an open airway. Custom made oral appliances are proven to be more effective than over-the-counter devices. Therefore, the over-the-counter devices are recommended not to be used as a screening tool nor as a therapeutic option. Oral appliance therapy can be used as an alternative to CPAP therapy for the treatment of mild to moderate sleep apnea and for those patients who prefer OAT to CPAP. Oral appliance therapy is a first line therapy for the treatment of primary snoring. Additionally, OAT is an option for those that cannot tolerate CPAP as therapy or who have experienced insufficient surgical results. Dr. Clarkson is a member of the American Academy of Dental Sleep Medicine and a member of the American Academy of Sleep Medicine.